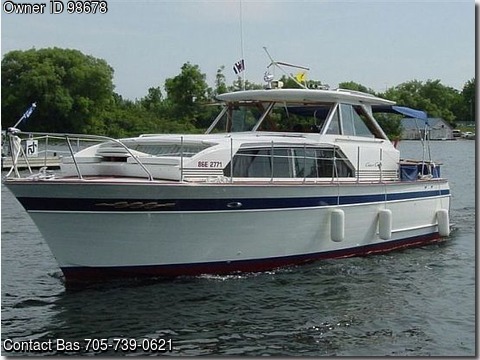 Boat is located in Barie,Ontario,Canada.Please contact the owner @ 705-790-nine seven nine eight or cvisser108(at)icloud(dot)com…The INTERLUDE is a beautiful 34 ft.
Classic wood boat with a 12 ft. beam.Located in Port Severn, Ontario. A great Family boat ,very spacious, well looked after, Original delivery slip ,and boat and engine manuals, spare parts, Incl. 1 Bronze shaft – 2013 Survey. Hull: Phillipine Mahogany Hardtop: fibreglass. ENGINES: Twin Chris Craft 350 CID–1996, Gas Chevy Corvette, heavy duty 4 bolt Main bearings Paragon hydrolic shift transmissins (2.5:1) rebuild 1996.Stainless steel drip pans under engines and transmissions.Fuel pumps,– -Fuel filters/water seperators, Alternators ,Carborators and Water pumps, rebuild 1996.Fresh Water tank 25 gal.–Fuel tanks, 2@,75gal Holding tank 1 @30 gal. BATTERIES: 4 @ 6 V, – 1@ 12V and Charger. ELECTRONICS: Bendix auto pilot, Depth sounder, Laud hailer, VHF Radio, Compass, 1750 watt inverter, 19″; flat screen TV and DVD player Radio with Amplifier and speakers. Accomodations: 2 single and 2 double berths. 1 Electric head, 2 gal. electic hot water tank–AC/DC Norcold fridge,Microwave oven.Curtains,-Carpets, Clock,Barometer,Bilge blower,–2 Bilge pumps,Fume detector,Davits c/w winches,Dockside water,Danforth Anchor,2 boat hooks,6 fenders,6 mooring lines,Horn,Ships Bell.4 Fire extinguishers,ife ring,6 life jackets,–pressure water, Remote Search light,Shore power; 120V 30A,Shore power cord,Sinks: Gally 1,-Head,1 2 burner stove top Alcohol/Electric Swim platform, 2 swim ladders,Trim Tabs 2 Windshield wipers, Stern rail gate Taff rail curtains, Mahogany dinette table Bar.B.Q- in box used as footrest,–Large Cooler.Price is in Canadian dollars.